All components made in the U.S. or Europe. Product assembled in the U.S. The glass straw bottle that moms have been asking for is now avialable. 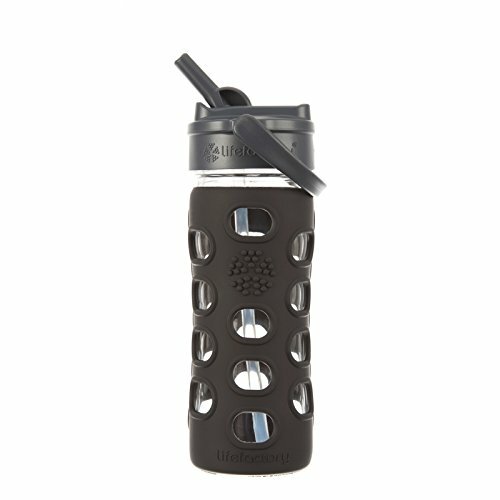 This kids glass straw bottle is holds 12oz of your childs favorite drink, the unique Lifefactory design of the flip top glass straw bottle makes it easy for smaller kids to drink out of the safest material...glass. Silicone sleeve, straw and polypropylene cap (PP#5) made in the U.S. The 12 oz Straw Cap with a raised grip oval sleeve pattern. The Straw Cap delivers upright, spillproof sipping (no tipping required). The polypropylene cap includes 1 silicone straw. The 12 oz is an ideal everyday companion that fits into handbags, backpacks and car cupholders. The volume works well for active kids as well as adults seeking a smaller capacity, lighter weight bottle. All caps from 16 and 22 oz bottles will fit on the 12 oz bottles. 12 oz (350 ml).